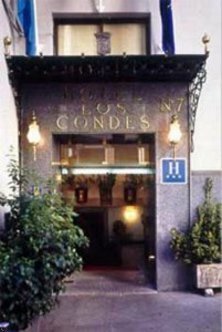 The Best Western Hotel Los Condes is located close to the Gran Via Street in the heart of downtown Madrid. The hotel is situated on a quiet street famous for its bookshops. The hotel has 68 rooms and an extremely pleasant atmosphere. The Best Western Hotel Los Condes offers a salon, cafeteria and public parking within 250 meters. Each room features a bathroom, color television, piped music, safe deposit box, air-conditioning, direct dial phone and mini-bar. The hotel was remodeled in July 2002.